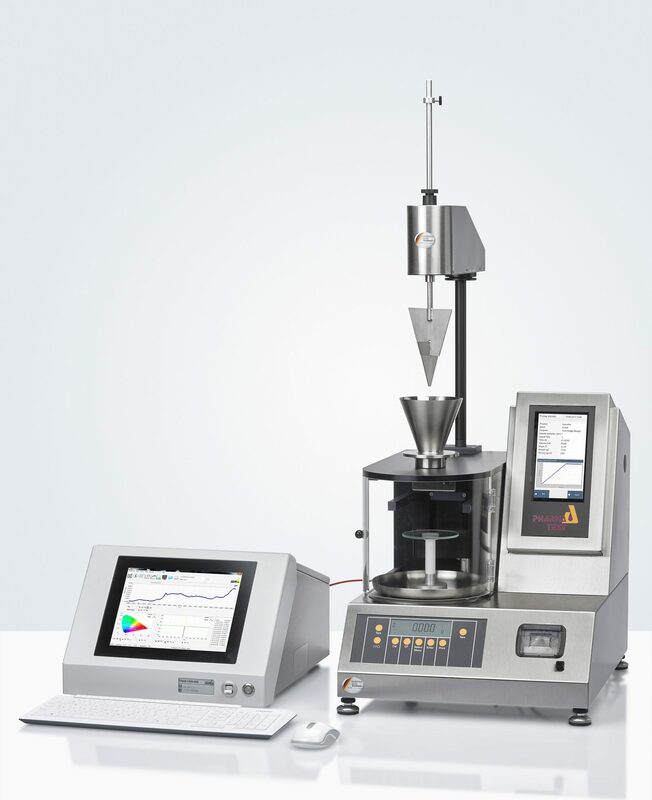 The PTG-NIR automatic powder and granule analysis system combines the Pharma Test PTG-S5 powder flow testing instrument with an integrated J&M TIDAS® L NIR diode array spectrometer. The system is controlled by the powerful TIDASDAQ3 software including a customized script for the PTG-NIR. 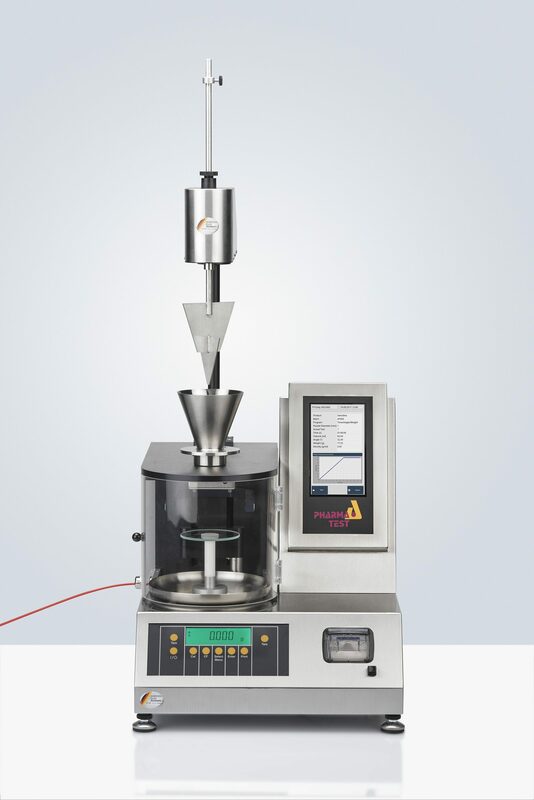 The system is ideal to examine the flow characteristics of a powder or granule. This combination is ideal for simultaneous detection of chemical, physical and morphological information. This information is describing the flow behaviors of a powder or granule. Other forms of solids are possible to be tested too. All the results are presented in a single report generated by the included TIDASDAQ3 software. The J&M TIDAS® L NIR diode array spectrometer is built-into a separate stainless steel housing from which the fiber optic cable is directly connected to the PTG-S5 instrument. This combination is the PTG-NIR. The NIR measurement accessory greatly expands the application range of the standard PTG-S5 instrument. This innovative approach means that the range of analytical information available from a single powder sample has now been greatly increased. In Pharmaceutical applications, it is now possible analyze all incoming raw materials (e.g., non-active ingredients) regarding their content as well as their moisture. This quick and non-destructive test provides all information required before the material is passed on into the production cycle. The flow characteristics and water content critically affect the way that the powder or powder mix will flow into the tableting machine for example. 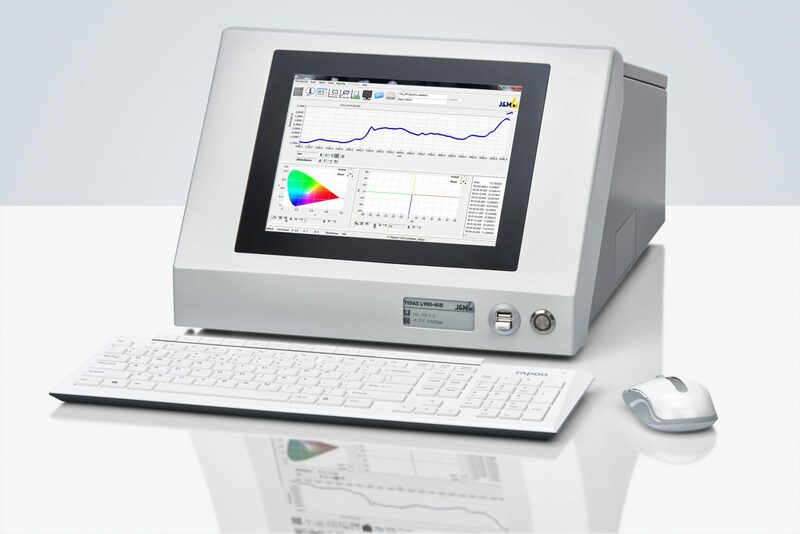 The TIDAS® L NIR is a diode array spectrometer. This technology is much faster compared to common scanning spectrophotometers. Instead of of the sequential scanning technique, the full spectrum is immediately detected and multiple wavelenghts may be examined at the same time. This way even fast spectral changes can be detected by the diode array spectrometer. The TIDAS® L NIR provides excellent signal to noise ratio to detect even weak signals. Typically the gratings and mechanical parts of scanning spectrophotometers are prone to misalignment and need frequent calibration. The TIDAS® L NIR contains no moving parts or gratings, greatly enhancing the systems reliability and long term stability. The PTG-NIR system incldes the powerful TIDASDAQ3 software package including a script customized for the PTG-NIR system. Results from both the PTG-S5 and the TIDAS® L NIR are stored and displayed by the software. The script makes it easy for the user to work with the system without requiring a deeper understanding of spectrophotometric theory or chemometrics. Quick access buttons make it easy to perform routine analysis once the method has been developed. For advanced users the full functionaly of TIDASDAQ3 remains accessible. The software is fully 21 CFR Part 11 compliant, including an audit trail and multiple user levels.